Coming home has been interesting. The two weeks away helped to bring forward a number of new revelations. First, I noticed just how much more active I was in Texas than I am at home. I’m much more sedentary here. Here, when I exercise, it’s for exercise. There, I went out for walks because I enjoyed them, or because the people around me also liked to walk. I spent a lot of time going up and down the stairs for one reason or another so that I was active even when I wasn’t exercising. The whole environment was much more conducive to movement. That wasn’t just because I was on vacation. The few times I was at houses other than my dad’s, I was just as sedentary as at home. Which makes me wonder what I can do to reshape my environment to make it also conducive to movement. Second, the time away gave me a good outside look at what my antidepressant is doing to me. Namely, it’s been helping with anxiety, but with each shift up in dose, my focus and ability to communicate has been dropping. I often feel mildly intoxicated and/or half-asleep. Everyone quickly noticed just how often I zoned out of the conversation right in the middle of a sentence, or couldn’t shift topics easily. Everyone here has been exposed to that change gradually, so it was good to see reactions from people who haven’t been around me for some time. Unfortunately, my regular doctor has basically told me she can’t do anything more for me and to try to get in to see a specialist, which will take months in this area, so I’m on my own for now. Sigh. Third, also to do with this particular antidepressant, involves weight. While I was super-active on vacation, I managed to maintain my weight. In the week since I got home – eating about the same as on vacation, but much less active – I’ve been gaining about a pound per day. No, I’ve not been eating nearly enough to make that possible. This is the second time I’ve been on this antidepressant (first time pictured below), and the second time this level of medication has done this exact same thing to me. My doctor and I have been watching this in particular since I started the medication in December, but until I reached the current dose right before my vacation, the weight issue hadn’t reappeared. Yup, now it has. Again, I’m on my own for this. Ugh. So yeah. It’s back to square one for me. I guess it’s kinda the perfect time for it, since my birthday was on the 1st, and we had a big giant joint birthday party last weekend. (Laurence’s birthday was Monday, and both Jason’s parents have March birthdays as well.) Jason got me a Fitbit and has been doing challenges with me to try to help me to move more. He and Morrigan both got yoga mats, so it looks like we’re all going to be doing yoga together. I’ve cut back to the smaller dose of my medication since I received no direction from my doctor other than “go to someone else,” and I’m searching for a specialist. Hopefully – cross my fingers – that these little things can help me go from square one to actual progress this time!! But I don’t want to end this post on a such a terrible note. 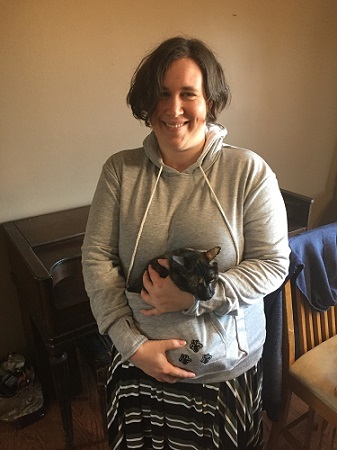 So instead, here’s a pic of one of my birthday gifts from my in-laws, a kitty-pouch sweatshirt that just fits Nimi, even if she’s not so sure of the situation. Ha! This entry was posted in Wellness and tagged health, psychology, Wellness Wednesday. Bookmark the permalink. DOCTORS!!! You would think they would be a little more helpful, like telling you to reduce your dosage or recommending a specialist rather than leaving you on your own. I cannot imagine what this is costing you either. (I’m still in sticker shock at the price tag of five simple tests run from three vials of blood and that was with insurance.) I hope you are able to find someone soon. You will notice that as the weather changes, us Cheeseheads find ourselves outside ALL. THE. TIME. It is how we have adapted to the crappy winters. We get outside as soon as it is tolerable and stay outside until fall and the weather forces us back indoors. Now, there are the weirdos who like winter sports and live for a good snowstorm so they can go snowmobiling, snowshoeing, cross-country skiing, etc. But for the most part, you will see so much more of your neighbors in another few weeks. Hopefully, that will help you stay more active as well. Yeah, it doesn’t help to have a 3k deductible. Oy. At least I’ve been through the rounds enough to KNOW to reduce the dosage myself, even if they don’t bother to suggest it. I’m just kinda miffed by the way my email was sent around to multiple people when it was only supposed to be seen by my doctor, and that she didn’t even bother to respond. 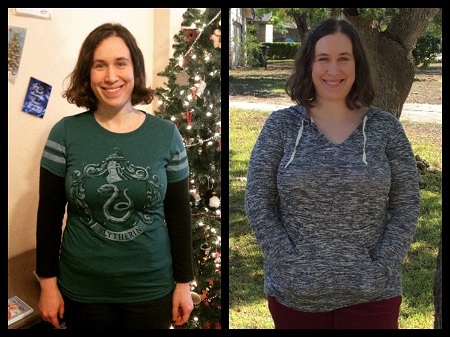 I was on a medication for five years that made me gain around 100 pounds! I had to get off of it. So scary the side effects that medications can have. Thinking of you.